A member of the Jamestown 8U Lime softball coaches pitch team readies to swing at a pitch thrown by coach Clint Conner, during practice July 10 at Seaman Park in Jamestown. The park will host the Ram-Page All-Star Tournament on Saturday and Sunday for area 8U and 10U baseball and softball teams. 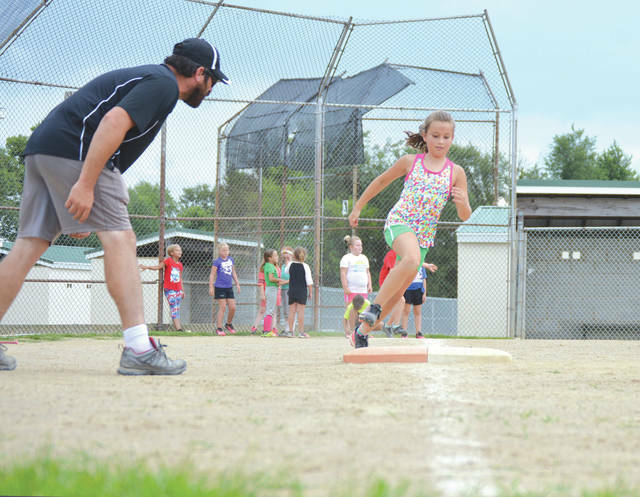 The Jamestown Youth Softball & Baseball organization’s 8U Lime coaches pitch softball team rounds first base as coach Clint Conner tells her whether to continue on to second base, or to hold up. The team was preparing for this week’s Ram-Page All-Star Tournament, which will be held July 14-15 at Seaman Park. With a mighty yell of “Mean Green!” the Jamestown 8u Lime coaches pitch softball team breaks the huddle after Tuesday’s July 10 practice at Seaman Park in Jamestown. 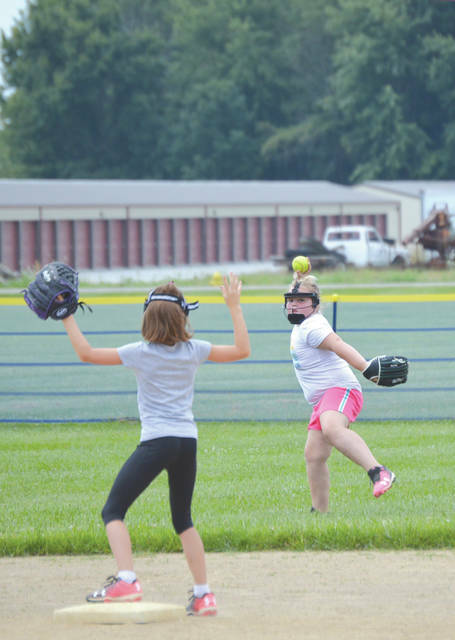 The shortstop provides a good second-base target as a JYSB 8U teammate fires the ball in from the outfield, during a July 10 practice at Jamestown’s Seaman Park. JAMESTOWN — As the kids filed into the dugout, coach Clint Conner asked his team what they had to do in 0rder to win this weekend’s Ram-Page All-Star Tournament. “WIN!” the kids screamed in almost perfect unison. “Well, yeah. But you can’t win unless you work hard at practice … right?” the coach calmly corrected them. “YEAH!” the kids all yelled. It was evident that the kids are fired up and ready to play in this weekend’s two-day tournament. 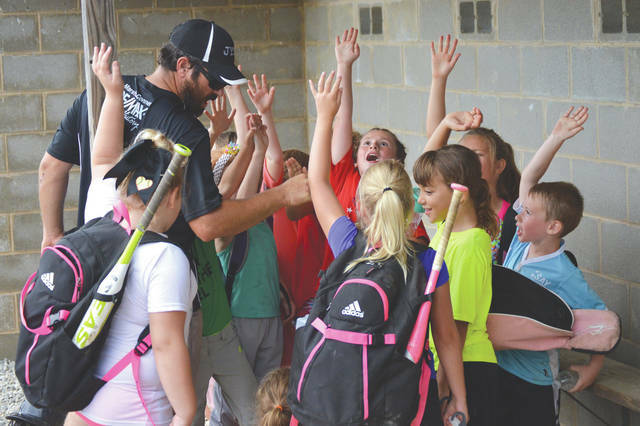 Conner and his assistant coaches Steve Conner and Nathan Christian were running a practice for the Jamestown Youth Softball & Baseball organization’s 8U Lime coaches pitch softball team on July 10. They got in some hitting, throwing, fielding and base running drills before a storm ended the practice early due to some lightning. The Ram-Page Tournament will take place on Saturday and Sunday, July 14-15 at Seaman Park. There will be an 8U and 10U youth baseball tournament, as well as a softball tournament for the same two divisions, going on for both days. Four tournaments in all. Conner says his 8U Lime team has made great strides since he first started coaching them last season. It’s estimated that more than 20 teams from the region will be on hand for this weekend’s tournaments, including JYSB’s 8U Black, Red, Navy, Orange and Green coaches pitch baseball teams, the 10U Royal, Red and Green Jamestown baseball teams, Conner’s 8u Lime bunch along with the 8u Yellow girls softball coaches pitch teams, and the 10U Sutton softball team as well. The tournament is still looking for volunteers to help keep the tournament and the concession stands running smoothly. Go to the Jamestown Youth Softball & Baseball page on Facebook, or go online at http://www.hometeamsonline.com/teams/?u=JYSB&s=baseball to learn how to signup. Contact John Bombatch at 937-372-4444, Ext. 2123. 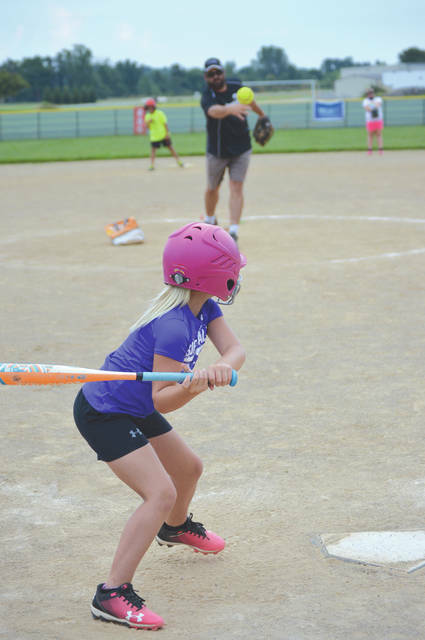 To volunteer for the July 14-15 Ram-Page All-Star Softball and Baseball tournaments, visit the Jamestown Youth Softball& Baseball website at http://www.hometeamsonline.com/teams/?u=JYSB&s=baseball.